Measure out 1/4 cup warm water in a glass measuring cup or bowl. Add yeast and honey. Mix to combine and then allow mixture to sit undisturbed for 5 minutes or until the mixture is foamy on top and smells like bread. Meanwhile, add remaining 1 1/4 cups warm water to a bowl. Add oats and ground flax. Allow this mixture to sit 5 minutes. After 5 minutes add the yeast mixture, oat mixture, whole wheat flour, all-purpose flour and salt. Using the dough hook, mix dough on medium speed for 4-6 minutes. If dough seems extremely sticky, add 1-2 tablespoons flour. Now add in 3-4 tablespoons of mixed seeds. mix until combined. Remove dough from bowl and knead with hands on a floured surface for a minute or two. Grease bowl you mixed the dough in and place dough back in the bowl. Cover with plastic wrap and place in a warm area for 1 1/2 to 2 hours or until the dough has doubled in size. Once dough has doubled in size, set slow-cooker to High. Line slow-cooker with parchment paper so it goes up the sides of the slow-cooker bowl. Punch dough down with your fist and then scoop it out onto a floured work surface. Knead dough a few times with your hands and then form dough into a rough oval or circle shape. Place dough inside slow-cooker. Brush dough with beaten egg and then sprinkle with remaining mixed seeds. Using a sharp knife, gently make a small slit down the center of the loaf. Drizzle seeds with 1-2 teaspoons honey. Place a large paper towel over the top of slow-cooker and then place lid on slow-cooker. Adding paper towel will help keep moisture off of the bread. Cook on High for about 2 to 2 1/2 hours or until the center of the bread is fully cooked. Remove from slow-cooker and let cool. Slice and enjoy! 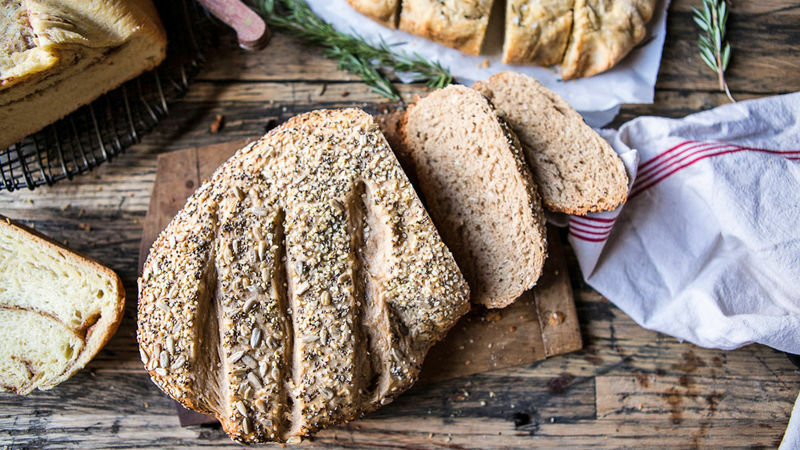 Use your favorite combo of nuts and seeds for this bread. I personally love hemp seeds, chia seeds, walnuts and sunflower seeds. This loaf of bread can also be baked in a 400ºF oven for 45-50 minutes.